Explore Kapaa real estate listings below, or learn more about what makes the town of Kapaa so popular among buyers. Get Kapaa Real Estate Listings Before Your Competition! Located on the eastern shore of Kauai, Kapaa is one of the largest cities on the island. Those who choose to invest in a Kapaa home for sale will find that their lifestyle is ideal. Nearby conveniences can be found within the town, but there is also plenty of natural spaces worth exploring. The Kapaa real estate market is a mixture of tropical condos, single-family houses, luxury estates, and undeveloped lots. Because of the exceptional diversity of this market, buyers are sure to find their dream property in this town. Whether you’re looking for a modest beachfront cottage or a resort-style property, living in Kapaa is an easy decision. Prices for a Kapaa home for sale begin around $500,000 for a single-family house and extend upwards of $2 million for one of the most luxurious properties on the market. The most affordable houses in this market can be beachfront homes in need of a bit of handy work or they can be modern residences near the mountains that offer every contemporary comfort. Buyers interested in recent construction should explore Wailua Homesteads which is located inland near the Wailua River State Park. Residences within this community enjoy a short commute to either Kapaa or the neighboring town of Lihue, where the airport is located. With charming mountain views, a centrally located country store, and a well-equipped park, this is quickly becoming one of the most popular new developments in the area. With some of the best views on the island, Kapaa homes for sale are difficult to resist. A lively town and incredible properties make this perfect Hawaiian community to invest in. Many buyers find that the affordable and elegant beachfront condos in Kapaa give buyers the dream home they've always wanted. In many older complexes you'll find fully renovated bathrooms and kitchens have enhanced these resort-style properties to best meet the needs of today’s homeowners. Many Kapaa homes for sale are just a few steps from the beach. For those who love to swim in tropical waters, sunbathe on sandy shores, or fish from the shallows, nothing could be more ideal. Buyers interested in a rural lifestyle far from the tourist rush will find many promising properties can be found up the hillside. There, backyard patios are blessed with exceptional views of the mountains and lush greenery. A little bit further away from the beach is the downtown area of Kapaa. Homes in the heart of this city are situated on larger lots and are within walking distance of shops, restaurants, and beaches. Open floor plans, wrap-around decks, and spacious bedrooms make these homes ideal for entertaining. Wet bars, granite countertops, and solar water heaters are only a few of the updated features that many Kapaa properties offer. Kapaa High School is one of the oldest on the island and was first established in the late 1800s. Today, it’s one of the best schools on the island. The school has a diverse selection of sports for children to choose from including football, cross country, volleyball, soccer, and more. Unlike many other American high schools, Kapaa High School doesn’t have a single mascot. Instead, students of each graduating class vote on a mascot for their year. When it comes to recreation, Kapaa is full of parks and greenspaces. As such, residents are never without a spot where they can play fetch with the dog, plays sports with the kids, or enjoy a family picnic. 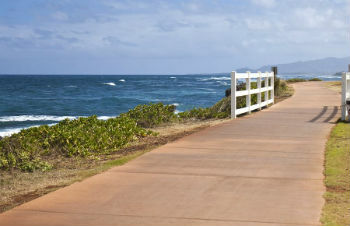 Along the water, Ke Ala Hale Makalae Path takes walkers past incredible vistas of the Pacific. These amenities and shopping facilities make Kapaa a popular tourist area. Additionally, Kapaa homes don't stay on the market for very long so buyers shouldn't wait to find their dream property in this charming town. To learn more about purchasing or selling Kapaa real estate, contact Anne Eliason. With years of experience buying and selling Kauai real estate, she can help make your next Kauai luxury real estate transaction simple.